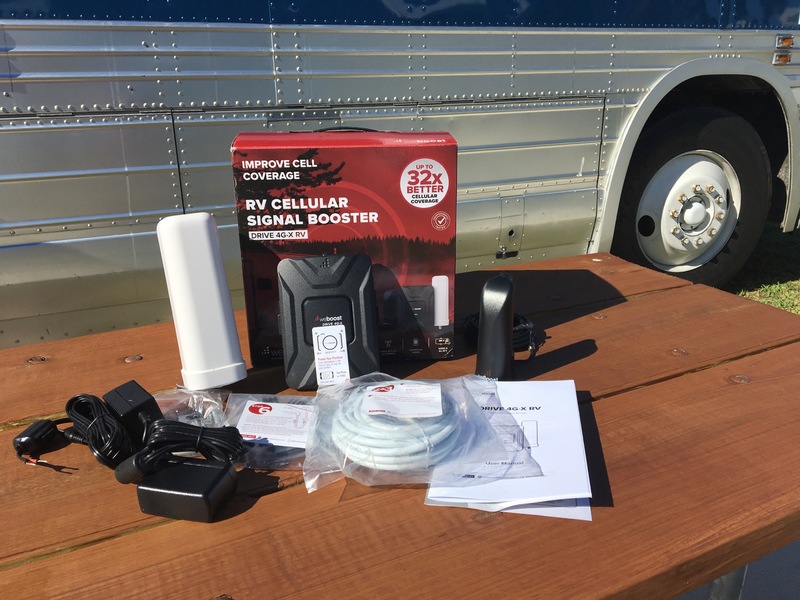 The new weBoost Drive 4G-X RV kit combines our favorite cellular booster with an indoor and outdoor antenna in a kit many RVers may find appealing. 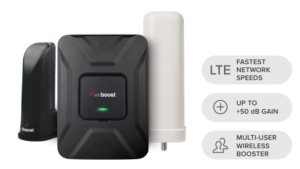 When weBoost first announced the Drive 4G-X cellular booster in February 2015, they also announced a special weBoost Drive 4G-XR bundle "coming soon" that was intended specifically for RVers. For the longest time - this upcoming kit was even featured prominently on the weBoost website. "The Drive 4G-XR is a kit that could take another year to launch, but it will be very similar to the Drive 4G-X just added antenna accessories." 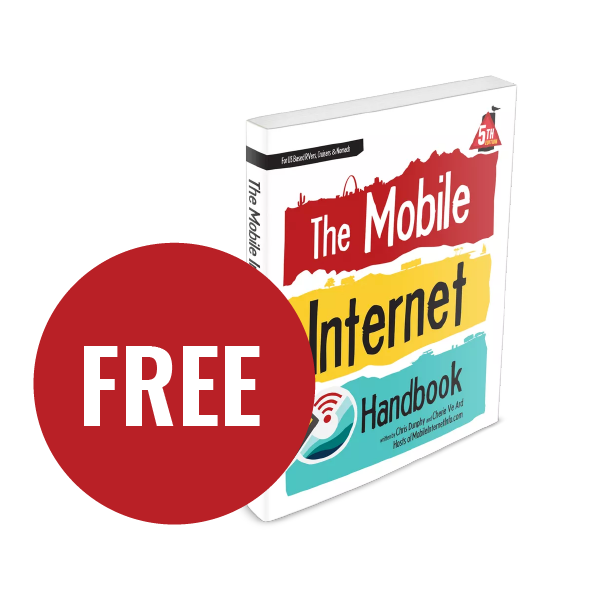 When weBoost launched the 4G-X OTR kit intended for semi-trucks (with a hefty 24" tall antenna!) last summer, they marketed it to RVers as well. But the tall antenna made it a tough fit for many RV installations. 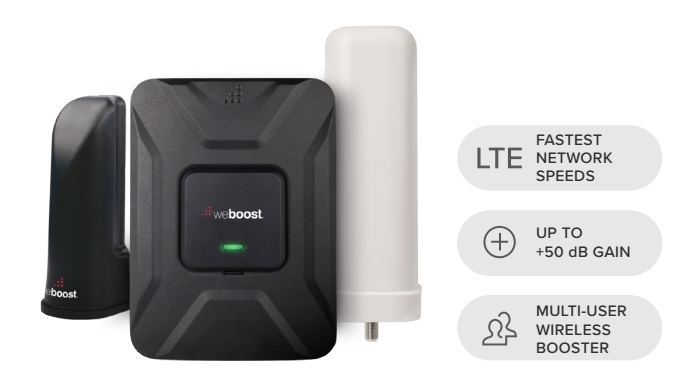 But at long last, weBoost today has announced an official kit based on the Drive 4G-X booster explicitly for RVers - the Drive 4G-X RV. But was it worth waiting for? 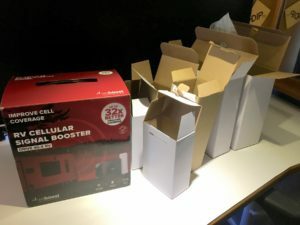 weBoost sent us a kit to preview a few weeks ago, and here are the details. What's In The Kit - A Lot of Boxes! The Driver 4G-X RV kit is broken down into installation steps, with each step packaged in its own box. That's a LOT of boxes! 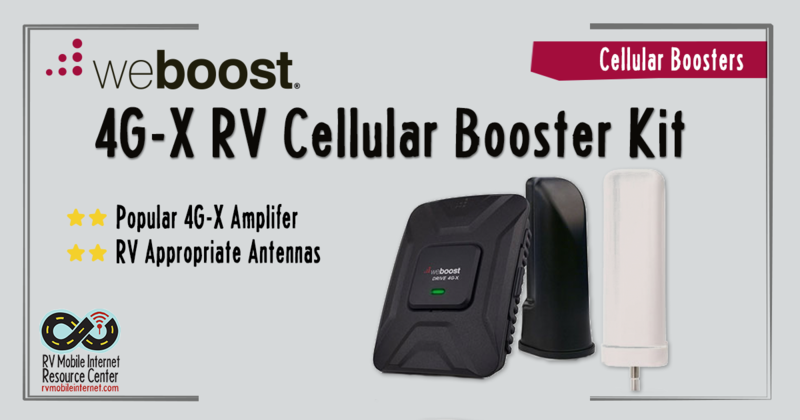 At the heart of the 4G-X RV kit is the same tried-and-true 4G-X booster we have recommended for over a year. But weBoost replaces the 4" stubby mag-mount antenna in the base kit (originally intended for mounting onto metal vehicle roofs) with a new outdoor antenna, the weBoost 4G Omni antenna (normally $79) that is 7.5" tall. 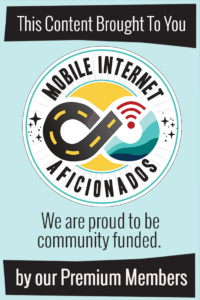 This isn't actually a new antenna - this has been available as an option with weBoost's residential boosters for a while now. It should be able to more easily mount to an RV ladder, exterior wall, or to a flagpole - and it does not require a metal ground plane. To provide indoor coverage, weBoost is now including a 4G Desktop Antenna - which theoretically should provide a bit more interior coverage area than the stock small paddle antenna included in the other 4G-X kits. This new indoor antenna is directional and broadcasts out in a 120-degree slice to better focus the interior coverage area. A similar antenna has been used before in the weBoost RV 4G kit (built around a much less capable booster). 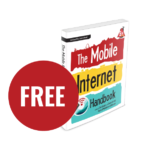 To complete the kit, weBoost includes 20' of RG-6 antenna cable, AC and DC power supplies, and even zip ties and a cable entry cover designed to waterproof any hole you may need to drill in your RV. The weBoost Drive 4G-X RV kit comes with everything you might possibly need for installation, including zip ties to secure the cables, and even a cover plate in case you need to drill a hole in your RV. 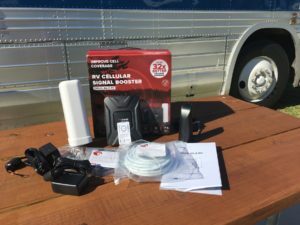 Does The Drive 4G-X RV Make Sense? The Drive 4G-X remains our top pick booster - but there are now three "official" versions available from weBoost. Though the antennas included vary - the core amplifier is identical between all these packages. Drive 4G-X (vehicle/original): Includes a 4" mag-mount roof antenna with gains ranging from .5 - 3.1 dB at the end of a 12.5' cable, and a small interior patch antenna - also on a 12.5" cable. Intended for installation on a metal vehicle roof. Many RVers have thrived with this kit, or have started here and upgraded to different antennas. $479. 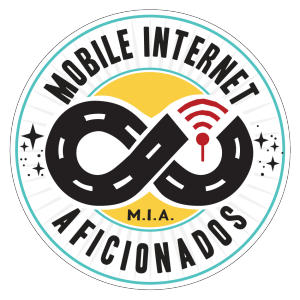 MIA Member Note: Please be sure to check your Member Discounts Page before ordering - many vendors offer our premium members special discounts that can add up very quickly! You can always buy the antennas separately to transform one kit into another. 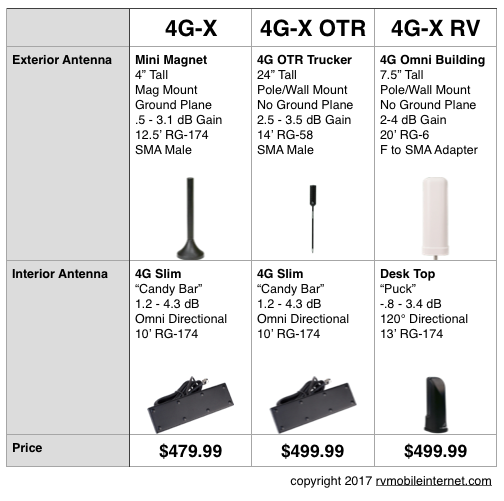 But at only a $20 list price premium, the OTR and RV bundles makes a lot of sense if they better fit your installation needs, rather than paying much more to buy an antenna upgrade separately later. The new weBoost Drive 4G-X RV kit. We are looking forward to testing the new 4G-X RV kit to see how it compares with the 4" stubby and the 4G-OTR antenna configurations. 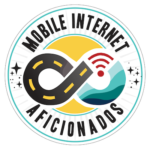 We'll be installing all three versions, plus the SureCall Fusion2Go-RV, Smoothtalker Mobile X6 and hopefully the as-of-yet unreleased Cel-Fi Go M kit - and taking them into the field for extensive head-to-head testing in known signal challenged areas. 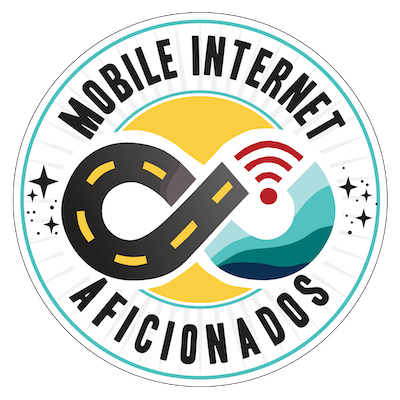 [Next Project] Cellular Signal Enhancing Field Testing Results (2nd Quarter 2017). Our members have additional exclusive access to some further details on this new booster kit that we have dug up.